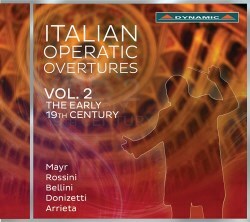 Since the Italian record company Dynamic, located in Genua, started operating in 1978, they have built up an impressive catalogue of recordings, not least of operas, many of them rarities and in a number of cases premiere recordings. Most of these derive from live performances usually in Italian opera houses and/or at festivals. That they now also recycle material from their back catalogue is no bad thing. A few years ago they issued some compilation CDs with arias and scenes from, mostly, rare operas and here now is a well-filled disc of Italian opera overtures. This is volume two – I missed volume one – and it covers the early 19th century. The first composer, Simone Mayr, was German but spent most of his life in Italy, from 1802 until his death in Bergamo, where one of his pupils was Gaetano Donizetti, also represented on this disc. During the last few years Mayr’s music has been attracting much attention through a comprehensive series of recordings on Naxos, masterminded by the indefatigable Franz Hauk. More is probably in the pipeline. This composer was hitherto best known for the opera Medea in Corinto from 1813, which was his greatest success. It has been recorded a number of times, the first time, as far as I know, as early as 1969. The overture is a fine work, which after a somewhat hesitant start gains momentum. With Mayr’s usual skilful orchestration this becomes a dramatic and partially dark piece heavy with foreboding. There follow four Rossini overtures. Many of these survived in concert halls long after they had disappeared from the opera houses. Today most of his operas have been brought back into circulation. The overtures are infallibly colourful and stirring starting points for an evening in the opera house. The first of these is a rarity. Demetrio e Polibio was premiered in 1812 but it predates La cambiale di matrimonio (premiered in 1810) by several years. It is supposed to have been written as early as 1806 when Rossini was only 14. The overture is, as Danilo Prefumo writes in his liner-notes, a bit immature, but one recognizes the master-to-be, at least in the concluding crescendo, which was to be his hallmark. L’italiana in Algeri, premiered on 22 May 1813, has proven to be one of his most successful operas, and the brilliant overture has also become a popular number on the concert stage. Virtuoso playing is required, especially from the woodwind, and that is what it gets in this recording from Rossini’s birthplace, Pesaro. Il turco in Italia from a year later is a kind of companion to L’italiana, and has also achieved popularity in its own right. It follows the well-known pattern, certainly a winning concept, and stands out for its beautiful French horn solo. The overture to Semiramide, here conducted by Rossini scholar Alberto Zedda, is one of the composer’s most beautiful creations and a triumph of his by this time perfect orchestration. The work was premiered at La Fenice in Venice on 3 February 1823. At the time he was only 31 but had the majority of his works behind him. Verdi, late in his life, wrote: “Bellini is poor … in harmony and instrumentation; but rich in feeling and in an individual melancholy of his own! Even in the least well-known of his operas … there are long, long, long melodies such as no-one before him had produced.” This is very true. It is the melodies and the feeling that make his operas come to life. The two overtures here are rather plain and the Capuleti, fresh and exuberant, doesn’t seem particularly suited to the tragic drama that follows, but they live through the melodic inspiration. The two Donizetti overtures are from the early 1830s, and the one for Anna Bolena, has all the power needed to depict the predicament of the heroine. This opera is a masterwork, the composer’s breakthrough. Ugo, conte di Parigi is not one of Donizetti’s most celebrated works, but it has a great deal to offer and the overture is good. The greatest rarity in this collection is the concluding one. Emilio Arrieta was Spanish but he studied in Italy and also had an opera of his staged there. After that he returned to his country and found a patron in Queen Isabel II. Under her patronage La conquista di Granata was commissioned and premiered at the Real Palacio theatre in October 1850. It was a success but after that Arrieta mainly composed zarzuelas. The overture is a fine piece, opening with a fanfare and containing several catchy melodies. Readers should also know that the complete opera is worth their attention. Those who find the concept of this disc attractive can safely invest in it. The sound varies a bit, since recordings were made in various venues but the overall impression is good and we have a number of insightful conductors at work.